When I asked to be pointed to the travel books section, librarian Diane Walker perked right up and escorted me over to the shelves. You see, La Pintoresca library won the Grand Prize in the Frommer’s 2007 library display contest. A nationwide contest, folks! And what they won is a passel of Frommer’s 2008 travel guides!!! You can see photos of their winning display here. This is not just a one-off for the marvelous team at La Pint. They previously won a For Dummies library display contest (photos here). Women at Work has a new satellite office at La Pintoresca. 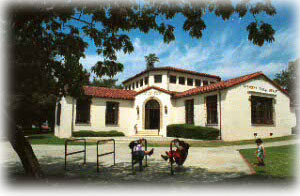 “At La Pintoresca Branch Library in Pasadena, Women at Work provides free assistance with career counseling, resume writing, interview skills, job applications, and other creer-related suppport on Tuesdays from 10:00 a.m. – 2:00 p.m. Sign up for a 45-minute counseling session by calling the library during regular hours at 626-744-7268. Why was I asking for travel guides? Because thanks to the generosity of one of my dad’s friends, I am traveling with my dad to England next week. Yes, indeed. I’m excited beyond words. I’m too excited to blog about it! Must prepare for trip! This entry was posted on 30 April, 2008 at 11:00 am and is filed under Around Town, Travel. You can follow any responses to this entry through the RSS 2.0 feed. You can leave a response, or trackback from your own site. Wow, that “For Dummies” one is amazing! Have a great time! I love England! Uh oh. I hope your dad doesn’t read your blog. How wonderful! Is this your first father daughter vacation? I’m feeling a tad melancholy because May 5th marks the anniversary of my father’s passing. I remember our one and only father/daughter trip with great affection. My dad never left the continent but together we did get to Bodie CA.! Have a lovely trip.